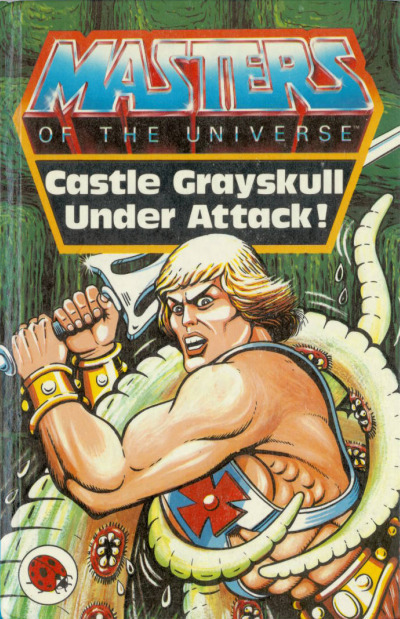 Castle Grayskull under Attack! is a 1984 Masters of the Universe children’s book written by John Grant and illustrated by Robin Davies. Here, Skeletor creates a giant machine to disable the heroes’ machines, vehicles, and weapons, and then attempts to flood Castle Grayskull. Holy smokes, there’s some crazy nonsense going on here. Teela’s beaming telepathic thoughts to He-Man again, but that’s the least of our problems. Skeletor dams a modest-sized river – which then creates such a flood that the water rises to the top of Castle Grayskull’s battlements (it’s also full of gigantic sea monsters). Even if we accept that Castle Grayskull isn’t situated next to a “bottomless” abyss like it is in the cartoon, this is still completely ridiculous. Furthermore, with all the machines disabled, Man-At-Arms builds a solar cannon – which he then transports to Castle Grayskull in the Wind Raider. And with the Battle Ram out of commission, it never even occurs to He-Man that he might go track down Battle Cat. It’s well and good to say that books like this are for kids, but this kind of thing is insulting to any reasonably intelligent eight-year-old. As in some of the other books in this series, it doesn’t seem like Grant is trying very hard. Davies has produced some truly terrible art in some of his previous work on Ladybird’s He-Man books, but this book contains some of his best. The figures still aren’t very good, but his scenery and backgrounds are actually quite solid, and the coloring is a highlight. But wow, what’s going on with the cover? He-Man looks like he’s being played by Klaus Kinski in an inflatable muscle suit. While Castle Grayskull Under Attack! isn’t the worst He-Man book we’ve ever seen, this clown show doesn’t have any significant merit.